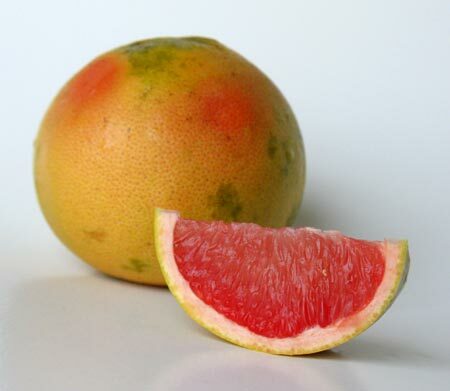 Red grapefruit from Broken J Ranch in Punta Gorda. Farmer Margie got these fruit from Broken J Ranch up in Punta Gorda, not too far from Worden Farm. From time to time, other natural, unsprayed citrus from there has appeared in the CSA boxes. Long time members may recall ponkans, a kind of tangerine with loose skin (sort of the shar pei of the citrus world) which came from Broken J also. There’s still some grapefruit to be had. Look for them at market this weekend before they’re all gone. On Wednesday, Chef Michael Schwartz stopped by the RITC market and scooped up 30 pounds of the fruit. As a result, shrimp with grapefruit, and grapefruit meringue tart have appeared on the menu for a short time, so get while the getting is good! Many of us used to have big mature trees that gave fruit just this sweet and good, before the State of FL mounted their ill-conceived, destined-to-fail War on Citrus Canker and stole our healthy trees. Now that’s a bitter fruit! Ah, the days of backyard citrus! I remember one neighbor had kumquats, a friend had key limes, and somebody else had oranges. My dad told me that canker was around when he was farming back on the 40s and 50s, but nobody made a big deal about it back then because it affected the look of the fruit and not the flesh or taste. These are beautiful. In our upcoming Winter issue, we have a story on backyard citrus that paints a very sour picture of citrus fruits because of citrus greening. (It seems canker was, pardon the expression, small potatoes compared to this lethal disease). Sigh! Looking forward to reading your article about citrus. Robert Barnum told me somebody from eSF came out for an interview. Bet that was fun! He’s quite colorful, and has an amazing collection of fruit trees.